As we mentioned in an earlier key metrics blog post, tracking Key Performance Indicators (KPIs) and key metrics will help your team measure what truly matters on your website. If you don’t measure these metrics, you won’t really know if your website is successful in meeting overall business objectives. How does your website support your organization? Create a spreadsheet matrix where you list all the strategic objectives you have come up with across the top of the matrix. You should try to stick to six or fewer objectives. Key metrics are the most important actions that you want your users to perform on your website. This can include signing up for a newsletter or blog, filling out a form, making an appointment, etc. Discuss the most important actions that take place on your website with your team and write these down on the left side of your matrix. There is no limit to the number of key metrics you track, and you can always add more, so don’t worry if you feel like you’re missing something. Now that you have your strategic objectives and key metrics defined, it is time to pair them on your matrix. Simply add a check mark or an X for each strategic objective that a key metric supports. It is alright to have multiple key metrics support the same overall strategic objective. The collection of key metrics under a specific strategic objective is how you create your KPIs. The strategic objectives are where you are going and the KPI is an indicator of how quickly you are getting there. So if your strategic objective is to generate more leads online, and blog subscribers and newsletter signups are your key metrics - then lead generation could be your overall KPI. Now that you have filled out the matrix, you can see how your key metrics and KPIs will help you track important actions and overall objectives for your website and business. Now that you know what you want your users to achieve on your website, it is time to figure out how your users are actually achieving it by identifying triggers. Triggers can vary depending on how your website works. The important part is to figure out what triggers a successful completion for each metric your team defined. As an example, a newsletter signup might be triggered when a user visits the "Thank You for Signing Up for the Newsletter" page or when the user clicks on the "Newsletter Signup" button. You should have a trigger for each key metric your team came up with so you know exactly how visitors are accomplishing the actions you want them to. And there you have it. After these four steps, you will know what objectives you are aiming for on your website and what actions on your website truly matter. While not as formal, a brainstorming session with your web team and stakeholders can be just as effective as the first method. Have your team brainstorm important actions that happen on your website and have them write each action they think of down on a sticky note. As people write down an action, they can immediately add the sticky note to the board. Once everyone has had a chance to brainstorm, you can start grouping these actions together into various overarching groups. These groups should represent your overall objectives. Name these categories as they relate to each other, and this part of the exercise will help establish your KPIs. For example, newsletter sign ups (a key metric) and blog subscribers (a key metric) could be under an overall lead generation KPI. Now that your team has an overview of key metrics and KPIs, you can start to tweak. Maybe you’ve thought of an additional key metric to support one of the strategic objectives or maybe there’s a different KPI that makes sense for certain actions. And after you’ve completed this method with your team, you will have established key metrics and KPIs to track and know if your website is successful. Want to learn even more about what’s important to track in analytics? 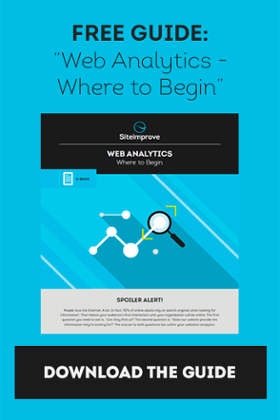 Download our e-book: Web Analytics – Where to Begin.